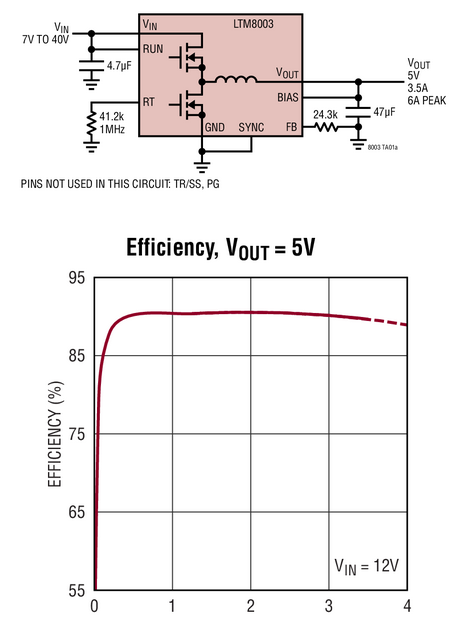 The LTM®8003 is a 40VIN, 3.5A step-down μModule® (power module) regulator. Included in the package are the switching controller, power switches, inductor, and all support components. Operating over an input voltage range of 3.4V to 40V, the LTM8003 supports an output voltage range of 0.97V to 18V and a switching frequency range of 200kHz to 3MHz, each set by a single resistor. Only the input and output filter capacitors are needed to finish the design. The low profile package enables utilization of unused space on the bottom of PC boards for high density point of load regulation. The LTM8003 is packaged in a thermally enhanced, compact over-molded ball grid array (BGA) package suitable for automated assembly by standard surface mount equipment. The LTM8003 is RoHS compliant.